Lord Tiger is a fine name. Then came the infamous Shere Khan. My father would read us the Jungle book, during the long starry African nights. No TV then. Thank God for small favours. Mowgly and Shere Khan, by Paul Durant, in Le livre de la jungle, (c) Delagrave, 1962. White tiger, Singapore zoo, 2017. The lord Tiger is the largest and most ferocious predator on Earth. They roamed the planet in most of Asia. There were 100,000 tigers in the early 1900’s. Only 3,000 to 4,000 remain in the wild today. Half in India. Unlike cats, tigers love water. Singapore zoo. 2017. Tuan marimau would be the Malay name? A rare California tiger. San Francisco. 2016. Like the Dragon, my Lord Tiger is ever present in Chinese representations. Here at a Buddhist temple in Penang. Or here. Is that a warrior facing the dreaded Tiger? The despised rival. By the Tiger. Lion on Khao San Road, Bangkok. Tiger beer is perfect for a hot afternoon. Try the Black Tiger if you ever have the chance. Shrine. Georgetown, Penang. Lao Hu would be Lord Tiger in Mandarin? With a bunch of accents my keyboard does not handle. Strangely enough, hardly saw any tiger in Bangkok. Live or represented. Except for this shrine, a tad dilapidated, on the way to Khlong Ban Luang, where the Artist House is. Preamcheasa Khla would be the Lord Tiger in Thai. I love the beer being included and that is one cute little kid! But you missed Tiger in Winnie the Poo! My favorite. Tiger teams, “mettez un tigre dans votre moteur” … ils sont partout. Dans les 5 animaux du qigong, le tigre arrive le premier, un très beau mouvement. L’ours arrive au milieu, avec une énergie considérable. En dernier arrive l’élégance de la grue. J’ai entendu mon mâitre de taïchi dire : “Carry Tiger to the mountain (un mouvement) : vas déposer ta colère dans la montagne !” Du coup, mon mouvement a une amplitude inhabituelle !!!! Merci, Brieuc, et une belle journée à vous. Tout-á-fait ça. I’d forgotten to mention the Tiger’s force, elegance and beauty. Bonne soirée Gilles. La grippe va mieux? Doucement et continûment. Je suis patient. Le virus moins ! Merci, Brieuc, et une fort belle journée à vous. Oh Brian, you do the most wonderful posts! I enjoyed this so much. You were such a handsome little boy. What a pity, that this magnificent animal has been reduced to such minimal numbers…mankind…tsk, tsk!! (Blushing) all kids are cute until age settles in. 🙂 Have a lovely week-end. Thank you for this homage to the Tiger! I had promised a picture of my (very) old mouse pad. Finally there it is! (Almost) twenty years old. But the image appeared. Well done. That is a very noble tiger. Despite the age. (I don’t even have a real mousepad anymore…) Bon week-end mon ami. 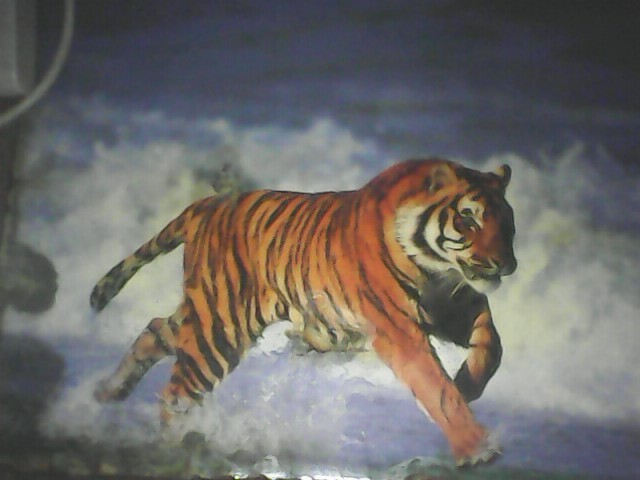 A tiger running through the foamy waves… what better image to express freedom? You are a very good writer Brian, this was a great read. I love that your father read you “the jungle book” one of my all time favourites. Thank you my dear. You too. That’s an interesting blend of artistic representations. The live creatures (including young, enthusiastic boy) are magnificent. Thank you. On all accounts. You have read the little boy and the tiger, so this image completes the story. Bon week-end. All well in Angers? I’d only vaguely heard of Blake. Never read him. Thank you for the introduction, Paul.